The Museum and Field Stations Facility ('MFS Facility') at NCBS has produced and/or supported the following publications. These publications are from: (a) NCBS researchers and/or curators associated with the MFS Facility (marked bold), (b) research associates and unaffiliated researchers who have deposited their type and other specimens in this facility on which new species descriptions, taxonomic revisions, ecological studies and other scientific works are based, and (c) researchers and projects that have used field stations supported by the MFS Facility. Nitin, R., A. Sengupta, and K. Kunte. 2018. Butterflies of Bengaluru. A brochure produced by the National Centre for Biological Sciences, in collaboration with the Karnataka Forest Department and Indian Foundation for Butterflies. Download a sample (1MB). Sondhi, S. 2017. Butterflies of Eaglenest. A brochure produced for and funded by the Department of Environment and Forest, Arunachal Pradesh, with Titli Trust, and National Centre for Biological Sciences. Kunte, K., and V. Giri. 2016. New Species Discovered by NCBS: Exploring and Conserving India's Biodiversity. A poster produced by the National Centre for Biological Sciences. Download a copy (3.4MB). Sanap R.V., J.T.D.Caleb and A. Joglekar. (2019) A new species of the hisponine jumping spiders from India (Araneae: Salticidae), with some observations on its life history. Arthropoda Selecta 28 (1): 113-124. Holotype and Paratype deposited of Jerzego sunillimaye sp.nov. deposited in the NCBS research collections. Kulkarni, M. L. & Dupérré, N. 2019. Description of a new species of Althepus (Araneae: Ochyroceratidae) from Maharashtra state, India. Munis Entomology & Zoology, 14(1):158-164. Althepus devraii sp. nov. Holotype and Allotype deposited in the NCBS research collections. Agarwal, I., S. Mahony, V. B. Giri, R. Chaitanya, and A. M. Bauer. 2018. Six new Cyrtodactylus (Squamata: Gekkonidae) from northeast India. Zootaxa, 4524:501-535. Type specimens not in NCBS. Mirza, Z.A., 2018. A new cryptic species of ground-dwelling Hemidactylus (Squamata: Gekkonidae) from southern India. Phyllomedusa: Journal of Herpetology, 17:169-180. Hemidactylus vijayraghavani sp. nov. Holotype and Paratype deposited in the NCBS research collections. Mirza, Z.A. and A. Mondal. 2018. A new genus Gravelyia with two species of the family Nemesiidae (Araneae: Mygalomorphae) from India. Acta Arachnologica, 67(1), pp.43-48. New genus, Gravelyia gen. nov., proposed with two species descriptions, Gravelyia striatus sp. nov. and Gravelyia excavatus sp. nov.. Holotypes and paratypes deposited in the NCBS research collections. Mirza ZA, G. G. Gowande , R. Patil , M. Ambekar , Patel H. 2018. First appearance deceives many: disentangling the Hemidactylus triedrus species complex using an integrated approach. PeerJ 6:e5341 https://doi.org/10.7717/peerj.5341. Description of two new species of lizards, Hemidactylus whitakeri sp. nov. and Hemidactylus sahgali sp. nov. Holotype and paratypes of both species deposited in the NCBS research collections. Huang, Z., H. Chiba, J. Jin, Athulya Girish K., M. Wang, K. Kunte, and X. Fan. 2018. A multilocus phylogenetics framework of the tribe Aeromachini (Lepidoptera: Hesperiidae: Hesperiinae), with implications for taxonomy and historical biogeography. Systematic Entomology, in press. Description of two new genera of butterflies. Voucher specimens used in the butterfly phylogeny deposited in the NCBS research collections. Marathe, K., A. F. Sanborn, and K. Kunte. 2018. Revision of the genus Rustia Stål, 1866 (Hemiptera: Cicadidae: Cicadinae) including a generic synonymy, four new combinations, and two new species from the Western Ghats, India. Zootaxa, 4457:431–443. Description of two new species of cicadas, Rustia minuta sp. nov. and Rustia kodagura sp. nov. Holotype and paratypes of both species deposited in the NCBS research collections. Marshall, D. C., M. Moulds, M. Boulard, A. F. Sanborn, A. Ewart, C. Wei, K. Marathe, L. W. Popple, B. W. Price, and C. Simon. 2018. Case 3761 — Platypleurini Schmidt, 1918: Proposed precedence over Hamzaria Distant, 1905 to conserve nomenclatural stability in the Cicadidae (Insecta, Hemiptera, Auchenorrhyncha, Cicadoidea). The Bulletin of Zoological Nomenclature, 75:49-54. Petition to ICZN to give taxonomic priority to Platypleurini over Hamzini. Marshall, D. C., M. Moulds, K. B. R. Hill, B. W. Price, E. J. Wade, C. L. Owen, G. Goemans, K. Marathe, V. Sarkar, J. R. Cooley, A. F. Sanborn, K. Kunte, M. H. Villet, and C. Simon. 2018. A molecular phylogeny of the cicadas (Hemiptera: Cicadidae) with a review of tribe and subfamily classification. Zootaxa, 4424:1–64. Voucher specimens used in the global cicada phylogeny deposited in the NCBS research collections. Agarwal, I., A. Khandekar, U. Ramakrishnan, R. Vyas, and V. B. Giri. 2018. Two new species of the Ophisops microlepis (Squamata, Lacertidae) complex from north-western India with a key to Indian Ophisops. Journal of Natural History, 52:819-847. Description of two new species of lizards, Ophisops kutchensis sp. nov. and Ophisops pushkarensis sp. nov. Holotype and paratype of O. kutchensis and paratype of O. pushkarensis deposited in the NCBS research collections. Vineeth, K. K., U. K. Radhakrishna, R. D. Godwin, S. Anwesha, K. Patil Rajashekhar, and N. A. Aravind. 2018. A new species of Microhyla Tschudi, 1838 (Anura: Microhylidae) from West Coast of India: an integrative taxonomic approach. Zootaxa, 4420:151–179. Description of Microhyla kodial sp. nov., holotype and paratypes deposited in the NCBS research collections. Jins, V. J., F. L. Sampaio, and D. J. Gower. 2018. A new species of Uropeltis Cuvier, 1829 (Serpentes: Uropeltidae) from the Anaikatty Hills of the Western Ghats of India. Zootaxa, 4415:401–422. Description of Uropeltis bhupathyi sp. nov., holotype and paratypes deposited in the NCBS research collections. Bhaumik, V., and K. Kunte. 2018. Female butterflies modulate investment in reproduction and flight in response to monsoon-driven migrations. Oikos, 127:285–296. Caleb, J. T. D., R. V. Sanap, K. G. Patel, P. P. Sudhin, K. S. Nafin, A. V. Sudhikumar. 2018. First description of the female of Chrysilla volupe (Karsch, 1879) (Araneae: Salticidae: Chrysillini) from India, with notes on the species’ distribution and life history. Arthropoda Selecta, 27:143–153. Description of female Chrysilla volupe, voucher specimens deposited in the NCBS research collections. Kalesh, S., and Kripakaran M. 2017. A new species of Tyrannomyrmex Fernández 2003 (Formicidae, Myrmicinae, Solenopsidini) from Western Ghats, Kerala, India. Zootaxa, 4344:261–276. Description of Tyrannomyrmex alii sp. nov., holotype and paratypes deposited in the NCBS research collections. Sondhi, Y., I. J. Kitching, D. N. Basu, and K. Kunte. 2017. A new species of Theretra Hübner (Lepidoptera: Sphingidae) from the southern Western Ghats, India. Zootaxa, 4323:185–196. Description of Theretra shendurneensis sp. nov., holotype and paratypes deposited in the NCBS research collections. Agavekar, G., F. Hita Garcia, and E. P. Economo. 2017. Taxonomic overview of the hyperdiverse ant genus Tetramorium Mayr (Hymenoptera, Formicidae) in India with descriptions and X-ray microtomography of two new species from the Andaman Islands. PeerJ, 5:e3800. Descriptions of Tetramorium krishnani sp. nov. and Tetramorium jarawa sp. nov., holotype and paratypes deposited in the NCBS research collections. Joshi, S., and K. Kunte. 2017. Two new dragonfly species (Odonata: Anisoptera: Aeshnidae) from north-eastern India. Zootaxa, 4300:259–268. Descriptions of Cephalaeschna acanthifrons sp. nov. and Planaeschna poumai sp. nov., holotypes and paratypes deposited in the NCBS research collections. Marathe, K., H. M. Yeshwanth, D. N. Basu, and K. Kunte. 2017. A new species of Platypleura Amyot & Audinet-Serville, 1843 (Hemiptera: Cicadidae: Cicadinae) from the Eastern Ghats of Andhra Pradesh, India. Zootaxa, 4311:523–536. Description of Platypleura poorvachala sp. nov., paratypes deposited in the NCBS research collections. Joshi, S., J. Veino, D. Veino, L. Veino, R. Veino, and K. Kunte. 2017. Additions to the Indian dragonfly fauna, and new records of two enigmatic damselflies (Insecta: Odonata) from northeastern India. Journal of Threatened Taxa, 9:10433–10444. Description of female Anisopleura vallei. Mirza, Z. A., R. V. Sanap, and K. Kunte. 2017. A new genus and new species of diplurid spider (Araneae: Mygalomorphae: Dipluridae) from northeast India. Journal of Asia-Pacific Biodiversity, 10:32–38. Description of Orientothele alyratus gen. et sp. nov., holotype deposited in the NCBS research collections. Sanap, R. V., A. Joglekar, D. A. Prajapati, and J. T. D. Caleb. 2017. Two new species of Langelurillus Próchniewicz, 1994 from India (Araneae: Salticidae: Aelurillina). Zootaxa, 4318:135–146. Descriptions of Langelurillus lacteus sp. nov. and Langelurillus onyx sp. nov., holotypes and paratypes deposited in the NCBS research collections. Caleb, J. T. D., and R. V. Sanap. 2017. Rediscovery of Piranthus decorus Thorell 1895 (Araneae: Salticidae) after 122 years since the original description. Acta Arachnologica, 66:25–29. Rediscovery of Piranthus decorus. Caleb, J. T. D., G. B. Pravalikha, B. E. Johnson, M. Manyu, S. Mungkung, and M. T. Mathai. 2017. Hersilia aadi Pravalikha, Srinivasulu & Srinivasulu, 2014 a junior synonym of Hersilia savignyi Lucas, 1836 (Araneae: Hersiliidae). Zootaxa, 4254:396–400. New synonymy of Hersilia aadi. Giri, V., V. Deepak, A. Captain, A. Das, S. Das, K. P. Rajkumar, R. Rathish, and D. Gower. 2017. A new species of Rhabdops Boulenger, 1893 (Serpentes: Natricinae) from the northern Western Ghats region of India. Zootaxa, 4319:27–52. Description of Rhabdops aquaticus sp. nov., holotype and paratypes deposited in the NCBS research collections. Datta-Roy, A., V. Deepak, R. Chaitanya, C. Murthy, H. Bhosale, A. Lajmi, P. Karanth, K. Kunte, and V. Giri. 2017. On the taxonomic status of Eurylepis poonaensis (Squamata: Scincidae): resolving a long-standing conundrum. Salamandra, 53:389–397. Redescription of Eurylepis poonaensis. Mirza, Z. A., and D. Raju. 2016. A new rupicolous species of gecko of the genus Hemidactylus Oken, 1817 from the Satpura Hills, Central India. Amphibian & Reptile Conservation, 11:51–71 (e137). Description of Hemidactylus chipkali sp. nov., holotype deposited in the NCBS research collections. Price, B. W., E. L. Allan, K. Marathe, V. Sarkar, C. Simon, and K. Kunte. 2016. The cicadas (Hemiptera: Cicadidae) of India, Bangladesh, Bhutan, Myanmar, Nepal and Sri Lanka: an annotated provisional catalogue, regional checklist and bibliography. Biodiversity Data Journal, 4:e8051. An updated, annotated catalogue of cicadas of the Indian Subcontinent. Mirza, Z. A., R. V. Sanap, and K. Kunte. 2016. A new species of the genus Thaicharmus Kovařík, 1995 (Scorpiones: Buthidae) from northeast India. Euscorpius, 215:1–11. Description of Thaicharmus guptai sp. nov.
Mirza, Z. A., J. Y. Zende, and V. K. Patil. 2016. Notes on the trapdoor spider genus Tigidia Simon, 1892 (Araneae: Mygalomorphae: Barychelidae) with description of a new species from Western Ghats, India. Arachnology, 17:92-94. Description of Tigidia konkanensis sp. nov.
Mirza, Z. A., R. Vyas, H. Patel, J. Maheta, and R. V. Sanap. 2016. A new Miocene-divergent lineage of Old World racer snake from India. PLoS ONE, 11: e0148380. Description of Wallaceophis gujaratensis gen. et sp. nov.
Gowande, G., A. Mishra, and Z. A. Mirza. 2016. Neotype designation for Calotes versicolor Daudin, 1802 (Sauria: Agamidae) with notes on its systematics. Zootaxa, 4126:271-279. Neotype designation for Calotes versicolor Daudin, 1802. Mirza, Z. A. and G. Gowande. 2016. Neotype designation for Scorpiops pachmarhicus Bastawade, 1992 (Scorpiones: Euscorpiidae), with redescription and notes on the species. Euscorpius, 223:1-7. Neotype designation for Scorpiops pachmarhicus Bastawade, 1992. Joshi, S., O. E. Kosterin, and K. Kunte. 2016. New status for Fraser’s forgotten Aciagrion approximans krishna stat. nov. (Odonata: Zygoptera: Coenagrionidae) from the Western Ghats of India. International Journal of Odonatology, 19:41–51. New taxonomic status for Aciargion hisopa krishna Fraser, 1921. Caleb, J. T. D., and R. V. Sanap. 2016. Lessert’s rainbow spider, Stenaelurillus lesserti Reimoser, 1934 (Araneae: Salticidae: Aelurillina) from new localities in India. Acta Arachnologica, 65:83–87. Redescription of Stenaelurillus lesserti. Caleb, J. T. D., and M. T. Mathai. 2016. Extended boundaries of the ant mimicking sac spider genus Aetius O. Pickard-Cambridge, 1896 (Araneae: Corinnidae). Indian Journal of Arachnology, 5:36–41. Redescription of Aetius decollatus and new combination of Aetius tuberculatus comb. nov.
Caleb, J. T. D., and M. T. Mathai. 2016. A new jumping spider of the genus Stenaelurillus Simon, 1886 from India (Araneae: Salticidae: Aelurillina). Zootaxa, 4103:185–188. Description of Stenaelurillus metallicus sp. nov., holotype and paratypes deposited in the NCBS research collections. Caleb, J. T. D. 2016. Taxonomic notes on some ant-mimicking jumping spiders (Araneae: Salticidae) from India. Arthropoda Selecta, 25:403–420. Redescription of Myrmaplata plataleoides, Myrmarachne kuwagata, Myrmarachne melanocephala, Myrmarachne prava and Myrmarachne ramunni. Deepak, V., V. B. Giri, M. Asif, S. K. Dutta, R. Vyas, A. M. Zambre, H. Bhosale, and K. P. Karanth. 2016. Systematics and phylogeny of Sitana (Reptilia: Agamidae) of Peninsular India, with description of a new genus and five new species. Contributions to Zoology, 85:67–111. Descriptions of Sitana viciri sp. nov., Sitana laticeps sp. nov., Sitana spinaecephalus sp. nov., Sarada darwini sp. nov., and Sarada superba sp. nov., holotypes deposited in the NCBS research collections. Gower, D. J., V. Giri, A. Captain, and M. Wilkinson. 2016. A reassessment of Melanophidium Günther, 1864 (Squamata: Serpentes: Uropeltidae) from the Western Ghats of peninsular India, with the description of a new species. Zootaxa, 4085:481–503. Description of Melanophidium khairei sp. nov., holotype deposited in the NCBS research collections. Agarwal, I., Z. M. Mirza, S. Pal, S. T. Maddock, A. Mishra, and A. M. Bauer. 2016. A new species of the Cyrtodactylus (Geckoella) collegalensis (Beddome, 1870) complex (Squamata: Gekkonidae) from Western India. Zootaxa, 4170:339–354. Description of Cyrtodactylus (Geckoella) varadgirii sp. nov.
Deepak, V., A. Khandekar, S. Verma, and R. Chaitanya. 2016. Description of a new species of Sitana Cuvier, 1829 from Southern India. Zootaxa, 4139:167–182. Description of Sitana marudhamneydhal sp. nov.
Agarwal, I. 2016. Two new species of ground-dwelling Cyrtodactylus (Geckoella) from the Mysore Plateau, south India. Zootaxa, 4193:228–244. Descriptions of Cyrtodactylus srilekhae sp. nov. and Cyrtodactylus rishivalleyensis sp. nov.
Su, S., M. Lim, and K. Kunte. 2015. Prey from the eyes of predators: colour discriminability of aposematic and mimetic butterflies from an avian visual perspective. Evolution, 69:2985–2994. Toussaint, E. F. A., J. Morinière, C. J. Müller, K. Kunte, B. Turlin, A. Hausmann, and M. Balke. 2015. Comparative molecular species delimitation in the charismatic Nawab butterflies (Nymphalidae, Charaxinae, Polyura). Molecular Phylogenetics and Evolution, 91:194–209. Deepak, V., R. Vyas, V. B. Giri, and K.P. Karanth. 2015. A taxonomic mystery for more than 180 years: the identity and systematic position of Brachysaura minor (Hardwicke & Gray, 1827). Vertebrate Zoology, 65:371–381. Taxonomic reassessment of Calotes minor. Murthy, B. H. C. K., A. Bauer, A. Lajmi, I. Agarwal, and V. B. Giri. 2015. A new rock dwelling Hemidactylus (Squamata: Gekkonidae) from Chhattisgarh, India. Zootaxa, 4021:334–350. Description of Hemidactylus yajurvedi sp. nov., paratypes deposited in the NCBS research collections. Kiran, C. G., S. Kalesh, and K. Kunte. 2015. A new species of damselfly, Protosticta ponmudiensis (Odonata: Zygoptera: Platystictidae) from Ponmudi Hills in the Western Ghats of India. Journal of Threatened Taxa, 7:7146–7151. Description of Protosticta ponmudiensis sp. nov., holotype and paratypes deposited in the NCBS research collections. Kunte, K. 2015. A new species of Hypolycaena (Lepidoptera: Lycaenidae) from Arunachal Pradesh, north-eastern India. The Journal of Research on the Lepidoptera, 48:21–27. Description of Hypolycaena narada sp. nov., holotype and paratypes deposited in the NCBS research collections. Caleb, J. T. D., and R. Karthikeyani. 2015. A new jumping spider of the genus Cosmophasis Simon (Araneae: Salticidae) from Maharashtra, India. Acta Arachnologica, 64:97–99. Description of Cosmophasis undulata sp. nov., holotype deposited in the NCBS research collections. Caleb, J. T. D., S. Mungkung, and M. T. Mathai. 2015. Four new species of jumping spider (Araneae: Salticidae: Aelurillinae) with the description of a new genus from South India. Peckhamia, 124:1–18. Description of Langona albolinea sp. nov., Mashonarus davidi sp. nov., Phanuelus gladstone sp. nov., Phlegra prasanna sp. nov. First record of Aelurillus kronestedti in India and first description of the male of Stenaelurillus sarojinae. 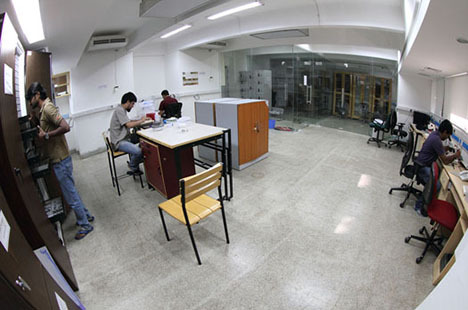 Holotypes and paratypes deposited in the NCBS research collections. Caleb, J. T. D., and M. T. Mathai. 2015. Description of a new species of Harmochirus Simon (Araneae: Salticidae) from South India. Munis Entomology and Zoology, 10:117–121. Description of Harmochirus exaggeratus sp. nov., holotype and paratypes deposited in the NCBS research collections. Joshi, S., and K. Kunte. 2014. Dragonflies and damselflies (Insecta: Odonata) of Nagaland, with an addition to the Indian odonate fauna. Journal of Threatened Taxa, 6:6458–6472. Caleb, J. T. D., and M. T. Mathai. 2014. Record of Araneus viridisomus Gravely, 1921 (Araneae: Araneidae) from Tamil Nadu, India. Indian Journal of Arachnology, 3:1–5. Redescription of Araneus viridisomus. Caleb, J. T. D., A. Christudhas, K. Laltanpuii, and M. Chitra. 2014. New species of Hyllus C. L. Koch (Araneae: Salticidae) from India. Munis Entomology and Zoology, 9:616–619. Description of Hyllus manu sp. nov., holotype and paratypes deposited in the NCBS research collections.